Air quality including the removal of airborne dust particulates, odour, fumes, oil vapours and grease is essential for health and relevant to a wide range of ventilation systems, especially when installed in industrial, hospital or catering environments. 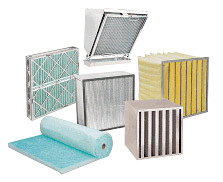 Alan Williams & Co offers its clinets access to the full spectrum of air filters for most applications and requirements. Our team of engineers can help you understand and select the correct air filter specification required for the air quality problem. Their understanding of the relevant legislation and the requirements of the health and safety regulations will ensure correct and efficient selection, installation and long life.